The Map Den – Mapping the latest interests in the GIS, Mapping, geography and everything quirky in between. Mapping the latest interests in the GIS, Mapping, geography and everything quirky in between. Another day, and another ‘international [insert here] day’. However, unlike ‘International Toast Day’ (15th July for those interested), today, 8th March, was one that actually had great significance – International Women’s Day. Despite being a guy, I recognise that while progress has been made, we are still some way of gender equality. Given that 50% of the world’s population is female, and there is no logical reason why income, job, social, educational opportunities and choices shouldn’t be the same as men – this situation isn’t good enough. However I don’t feel I should go on further, as I don’t think I can do the topic of feminism justice. What I can do is produce some geospatial analysis however to mark this. There are many areas I thought about looking into to highlight the amount of progress still needed; adult literacy, women in top managerial roles, reproductive rights etc, to name a few. However, I decided to analyse the percentage of the adult labour force that is female, using data sourced by the World Bank. 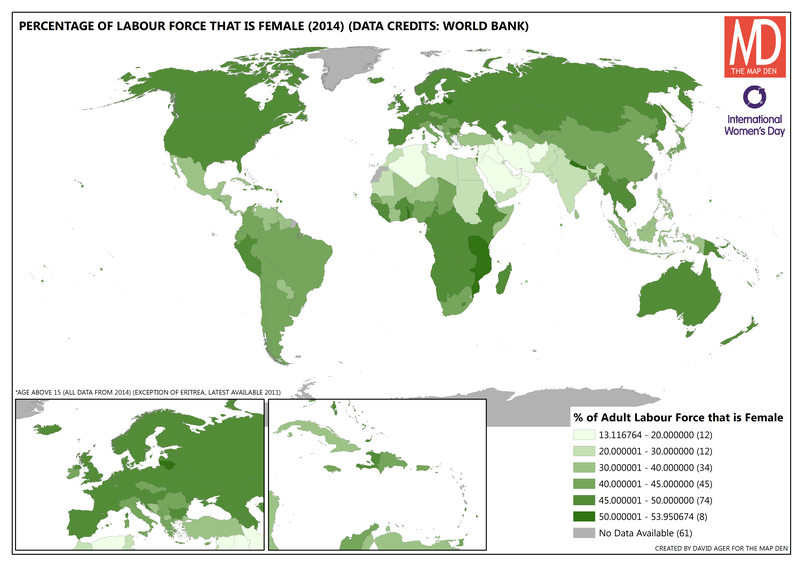 Data from 2014, in the map above, shows geographical and regional patterns of gender inequality in the labour force, particularly in stark in North Africa and the Middle East. Sure, a reasonable amount of ‘Western’ and African countries have more balanced levels of gender in the workforce, but only 8 countries have more women in the labour force than men. Meanwhile over 100 countries have less than 45% of women in the labour force, 24 of these a shockingly below 30%. There maybe several cultural, social welfare, developmental and even legal reasons why these patterns occur, which I won’t delve into, but it is a important indicator in of itself. This before you consider that this isn’t even the best indicator of gender inequality. This doesn’t account for the type of work being carried out by women here, which may be of lower wage and status, as well as population sizes and growth, leading to a skewing figures as well. It also doesn’t map, social attitudes to women, statistics can only allude. Even in a more gender equal workforce, this doesn’t mean the same opportunities or treatment. Progress is a key point here too, and while there is a general positive trend in percentage growth of women in the work force between 1990 – 2014, according another map I produced above, there are many places where growth is stagnant, or even decreasing in percentage. Encouragingly, the areas of low percentage in the previous map, are generally areas of overall relative growth in women in the workforce. Nonetheless, there are many areas, particularly in India and Syria (war an important proviso here), where whatever the story, there is a sharp overall percentage decrease. This is only one indicator, but it highlights that, while for some this may be nauseatingly politically correct, there is much progress to be made. Why does this matter? One, employment is an important factor in self-independence and social, academic and economic opportunities – a basic value that should be available to all, regardless of gender. Two, any organisation or company needs to thrive on the widest pool of talent and the diversity of ideas – with a greater gender equality (among ethnicity, sexuality and able-bodiedness), this is something that is potentially advantageous for us all. PS: I know the cartogram isn’t the ideal analysis for this data metric, as there is no land mass relationship really, but it does weight and enlarge higher workforce percentages more, highlighting interesting case like Nepal, Lithuania and East Africa. Mapping of the Arctic region has historically proved to be a challenge for cartographers and geo-scientists, though as referred to in a previous article (see here), local knowledge is valuable in contributing to knowledge of the often perceived ‘wilderness’ by ‘Westerners’. In many ways, as alluded to in Alastair Bonnett’s brilliant book, Off the Map, despite living in an age of digital mapping, there is much geographic knowledge still to be discovered. This is perhaps most relevant and important, given global warming, in the Arctic region, and two recent articles associated to this piqued my interest in this area, and thought it would be a good follow up to my previous Arctic related post. Happy St David’s Day/Dydd Gŵyl Dewi Hapus to all those around the world with Welsh links or sympathies. For those unaware, St David’s Day on 1st March, is the national day of Wales, celebrating the saint day of the patron saint of Wales, David, and is an excuse (if ever needed) to stock up on Welsh flags, sup some Brains Beer, tuck into Welsh rarebit and Welsh cakes, and sing Calon Lân while watching reruns of Wales beating England in rugby. With all stereotypes out the way, the nation building of Wales/Cymru is an interesting one. The history is uncertain, but Wales has it’s origins in the fall of the Roman Empire, with the Romans leaving, with a Romano-British culture with Latin, British and Celtic hybrid culture being left behind. With the subsequent invasion and/or assimilation of Anglo-Saxons into what we now know as England, Romano-British culture was pushed into Cornwall and Wales. While, Wales was eventually assimilated into ‘England’ over the following millennia, despite the legends of Romano-British lord, Arthur, and later resistance led by Owain Glyndŵr, however the language of Welsh/Cymraeg and Welsh culture identity still survives strong today. This history can be reflected in language and place names of Wales and England. ‘Wales’ comes from the Anglo Saxon, ‘Walesia’, ironically, meaning foreigner; whereas ‘Lloegr’ (England in Welsh) derives from ‘lost lands’. Additionally, ‘Cymru’ is thought to come from the word ‘Citizen’, i.e. citizens of Rome, and these Latin links can be seen in examples of Welsh words. For example, ‘bont’ (bridge) is similar to the also Latin-based French version, ‘pont’; similarly, ‘ffenestr’ (window) is similar to Italian, ‘finestra’. So why is this all on a mapping/geospatial blog? Because place names we have in our gazetteers, aren’t produced just randomly, they reflect history and culture, as I could easily do a similar description for another country or place in the world (you can get whole maps on this stuff!). 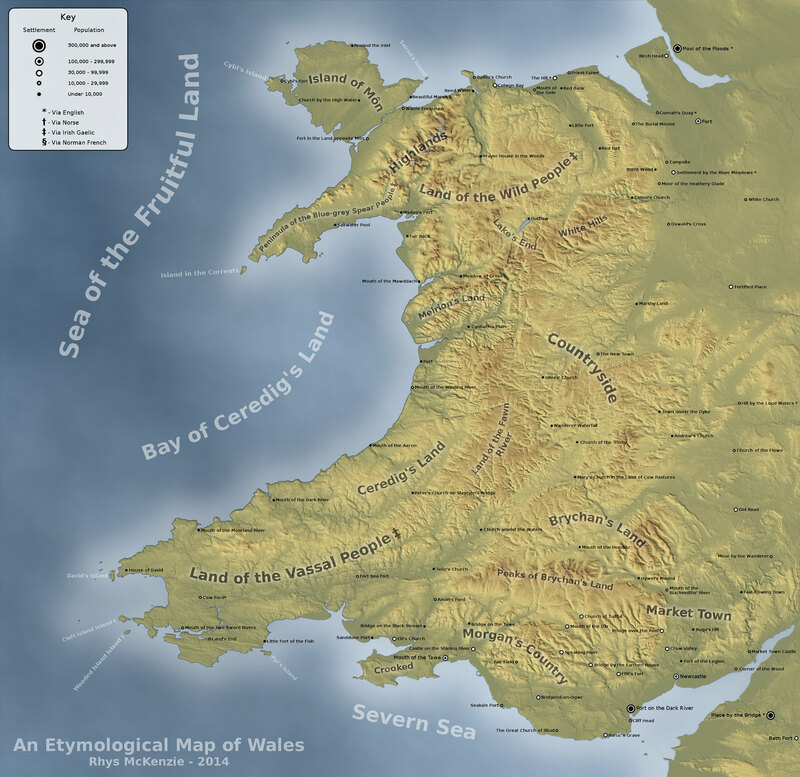 So I come to this fantastic map (see above) produced by Rhys McKenzie, a geo-scientist from Cardiff University, back in 2014, who researched and produced this fantastic etymological map of Wales. Hopefully the perfect thing to mark St David’s Day in the mapping world. While this site lives a digital world of geographical information, there is nothing quite like going to visit a real life, physical ‘map den’, and for those who are able to, I’d highly recommend going to visit The British Library in Central London. Their map room has one of largest collections of geographical information, with approximately 4.5 million entities. This alone should be a pull factor to have a ‘map’ day in London. However, up until March 1st 2017, there is a further reason to venture down, and this is because of the fantastic “Maps and the 20th Century: Drawing the Line” exhibition which is taking place there. I was fortunate to make it down in January with a few fellow GIS geeks and we all couldn’t recommend it highly enough. It is a journey from early maritime/global mapping, military and urban planning surveying of 19th and 20th Century, maps as a political tools and satire, through to live motion sensing mapping and digital mapping – and much more! 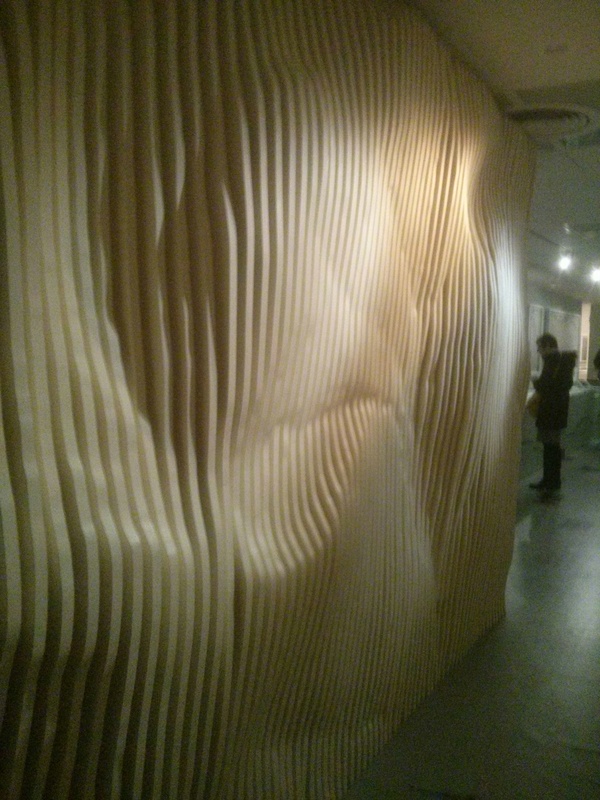 Plus contours on a wall, which by the way once you’ve finished with them, British Library, I’m happy to take them off your hands. Particularly encouraging as well as the demographic of audience; not just old hobbyists and (not as old) map nerds like us, but also schoolkids too, teaching the next generation of geographers and location specialists. P – Plan. Tickets required, plus make sure you have time, we spent almost 3 hours! One of the things I’ve enjoyed so far in creating The Map Den, is being able to share some of the latest and interesting pieces of work and tips coming out of the GIS and mapping industry. The ‘science of where‘ community is alive and strong. However, it’s time I did some original mapping content myself. Today I’m starting simple, but nonetheless importantly, looking at global urban and rural population increases. Fantastic bit of code and tutorial about aggregating point data for JSON objects using SQL.